Over the past couple of months, I've been rekindling my love for Enid Blyton books. She was my favourite author when I was little but I've never really stopped loving her. I re-read the Faraway Tree books last month (some of my all-time favourite books) and now I'm moving on to the Famous Five. I was more of a Secret-Seven fan when I was little but when I saw these Famous Five books today I couldn't leave them. The mystery collection is so beautiful and I can't wait to read them again. I've been meaning to read The Death and Life of Charlie St. Cloud, I Capture The Castle and Love, Stargirl for a while now, so I was really lucky to find them for 3 for £1. I don't know too much about them but I've heard good things. The Screwtape Letters is another one I've heard a bit about and it's described as being a 'masterpiece of satire' - I'm looking forward to giving it a go. 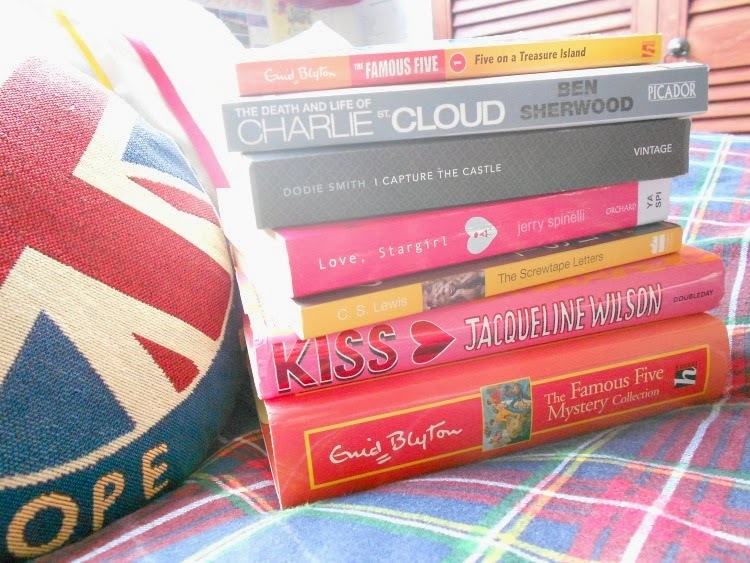 ^_^ Finally, I got Kiss by Jacqueline Wilson. I used to love Jacqueline Wilson when I was about 10 and Kiss was my favourite (along with Double Act) but I never owned a copy. I can't wait to read it again, 6 years later. Love, Stargirl!! I read and loved Stargirl, and then read that one. They're both awesome! Also GOOD OL' JACQUELINE WILSON! Lol. Happy reading! Great bargains! A friend of mine has been telling me to read The Screwtape Letters for ages, she can't recommend it enough. Hi, I'm a new follower! Enid Blyton and Jaqueline Wilson were probably the only authors I acctually read when I was younger. For Enid Blyton, I always really loved The Faraway Tree books, The Mallory Towers books, and the Five Find Outers books, and as for Jaquline Wilson, I just loved all her books so much. I Capture the Castle is one of my favorite books of all time. Its so beautiful and the narrator is one of the best.I hope you enjoy it. Double Act was always my favourite Jacqueline Wilson book. I really like my sister Jodie too. Book shopping is just the best, isn't it? I love browsing through the curling pages of old books in charity shops. Sometimes I find the most amazing books. My Sister Jodie is wonderful; it was the last Jacqueline Wilson book I read and I cried for hours after I finished reading it.